We all have patterns of behaviour that are based on our past experiences and built by our conditioning. To change or break these responses you must change or break these old patterns. Think of breaking a pattern like this example. Imagine walking across a field of wheat or long grass. You can’t help making an impression and when you look back there’s a track or pathway showing you where you have been. You have left a mark (in time). Now walk back down the same route several times, over and over, and the grass becomes more trampled to the point that you are able to follow this pathway easily and without thinking or trying too hard. The path is set. You follow the old path and get to the old place, simply and predictably. You have become unconsciously competent. The more you follow a familiar route (or a pattern, recipe, strategy or behavioural trait) then the more often the same outcome repeats itself. When you take action and interrupt the old pathway and change your focus a new pathway is created. The more you walk this new pathway the more it becomes stronger and more defined until the old one is no longer noticed or utilised at all. The interruption gets built into the old program or it simply becomes a part of the new pattern. 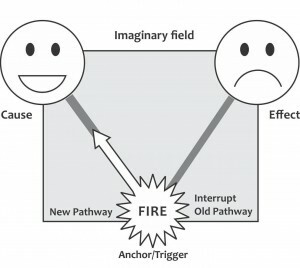 The brain is wired for change and to learn new things and so when you choose a better way and get rewarded, the new pathway becomes installed through repetition and the old path becomes redundant, forgotten or disconnected. Just like the grass or wheat, growing will dissolve the old pathway when it’s no longer used. It is nature’s way! In the beginning trying to do this can be challenging because you are consciously doing these actions and consciously making new pathways. It does become easier with practice and repetition, which is when your actions become natural and done unconsciously. 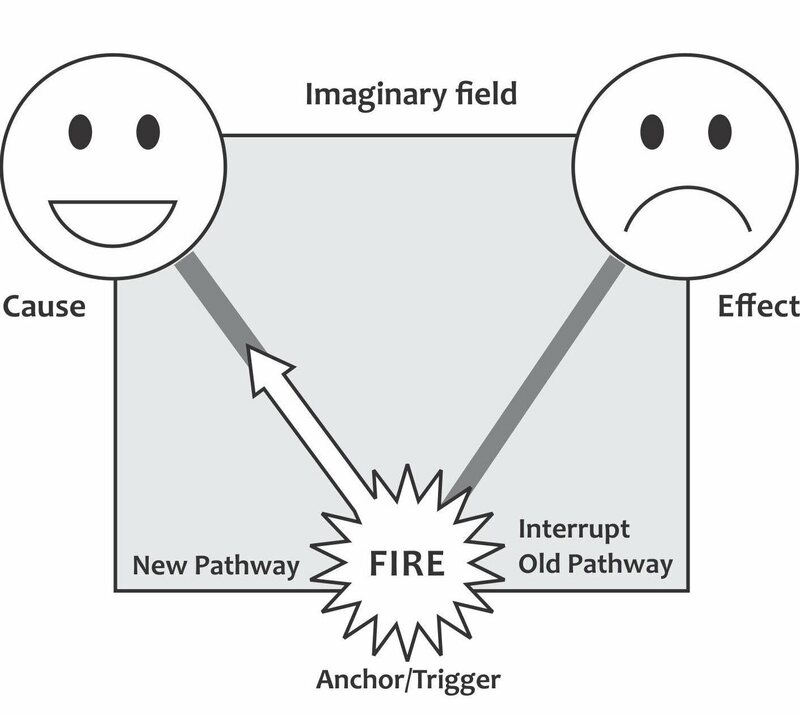 In the Imaginary field diagram 2 below, it’s the new pathway that becomes deeply engrained the more that it is walked and the old pathway diminishes or becomes redundant because it is no longer being used. It is your state of mind that, on the whole, dictates your mood and influences your behaviour and responses. So, with that in mind I would like to bring you back to your immediate world. What is your real state of mind now, today? How much are you genuinely enthused by the world you have created? How much, if anything, would you change? We have all just been through Christmas and its promises of peace and indulgences in excess. We are now back in the ‘real world’ whatever that is supposed to mean. It’s a new dawn, a new day, (a new year) . . . .and I’m feelin’ good. Really? It is no surprise that many of these ‘commitments’ will have failed or fallen by the end of the month. Why? Well, because our commitment was made in the wrong way to the wrong person. If you make a commitment, a resolution if you will, then you have to be so committed to it that you will in every way in every day follow this commitment through the maze of conditioning and habit, of peer pressure and media manipulation. I am not saying it cannot be done. Of course it can. My point is that if you only see your commitment as a transient ‘would like to have/be’ then you will soon find that old habits sneak back in and take over, closely followed by justification and acceptance. If you do wish your changes to be lasting and entrenched then first of all ask yourself is this a path I wish to take whole-heartedly. Am I prepared to walk the harder path until it becomes well-trodden and clear? In fact, am I prepared to create a new habit. This is a commitment to you and for you – not the world, the family, the squash team or the work colleagues. Forget them, they have their own habits to deal with and conditioned thoughts to justify. You are the only one who can see and set a new path. The only question is not IF it can be done but are YOU prepared to do it. It can be done. When you start this way, the path becomes clearer even before you start to walk it and there is always only one judge of whether you are happy on your path and only one guide who defines where that path will lead.